On July 2, 2018, on the feast day of the holy apostle Judas, the brother of the Lord according to the flesh and prelate of Job, the Metropolitan of Moscow in the Pokrovsky Stauropegial Convent, the birthday of his prioress Abbess Theophania (Miskina) was celebrated. All-night vigil and the festive Divine Liturgy on this day in the temple of the Resurrection of the Savior was performed by cleric of the monastery priest John (Kudlasevich). During the Worship prayed the abbess of the abode of the abbess Theophany with her sisters, pilgrims and parishioners of the monastery. Divine service chants were performed by the monastery choir. At the end of the Liturgy, the holy Apostle Judas, the brother of the Lord according to the flesh and Saint Job, Metropolitan of Moscow, was glorified. 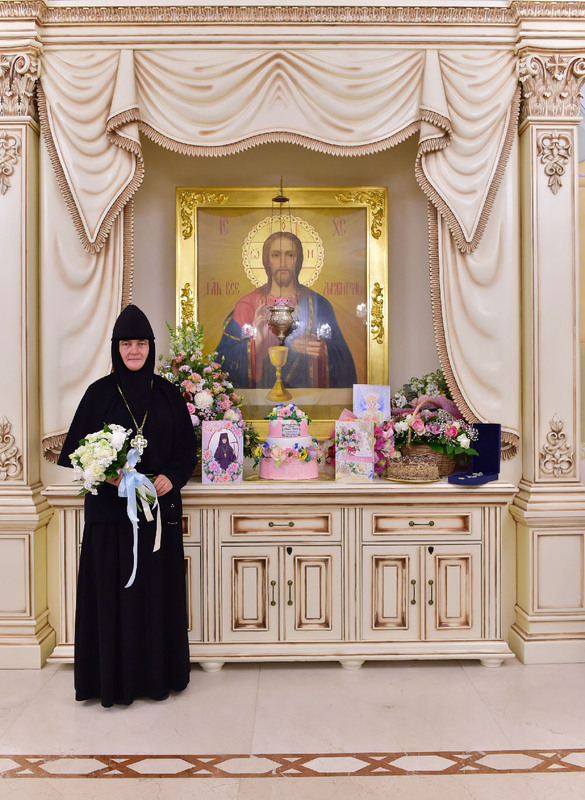 On the day of the namesake, Abbess Theophania was congratulated by the bishops of the Russian Orthodox Church, abbesses of women's monasteries, secular persons, parishioners, and employees of the monastery. The memory of the Holy Apostle Judah, the brother of the Lord according to the flesh, on June 19, according to art. / July 2, BC. In the exposition of St. Dimitry of Rostov, the Holy Apostle Judah belongs to the 12 disciples of the Lord. He came from the tribe of David and Solomon. Saint Judas was born in the Galilean city of Nazareth from the righteous Joseph, who was then engaged to the Most-Pure Virgin Mary. It is not known for certain who was the mother of Judah. According to some, it was Salome, the daughter of Haggai, the son of Varaheen, the brother of St. Zacharias, the father of the holy prophet and the forerunner of the Lord John. This Judas was the brother of the holy Apostle James the Righteous, the Primate of the Jerusalem Church. The Holy Apostle Judah is usually called Judas Jacob, that is, the brother of the Apostle James. He took this name in his humility, for he considered himself unworthy to be called the brother of the Lord according to the flesh, especially since he sinned against the Lord, first, by his lack of faith, and secondly, by his lack of brotherliness. That Judas has sinned with disbelief, St. John the Evangelist testifies to this, saying: "For His brothers did not believe in Him." (John 7: 5). Explaining this place of the Gospel, Saint Theophylact understands here under the brothers Christ's children Joseph. Namely, he says: "The reproach was delivered to Him-that is, to Christ-and the brothers, the children of Joseph (among whom was this Judas); where did they have such unbelief towards Him? - From their own bad will and from envy, for relatives tend to envy their own more than strangers. So, from this it is clear that Judas sinned before the Lord with his lack of faith. But Judas, moreover, had a curiosity with Christ, as it is written about in the life of Jacob, the brother of God. When Joseph, on his return from Egypt, began to share his land among his children, born of the first wife, he wished to devote a portion to the Lord Jesus, born natural and incorruptible from the Blessed Virgin Mary, then a young child. But the three sons of Joseph did not want to take Christ to their share, as born of another mother; only the fourth son - the holy Jacob accepted Him into joint possession of his part and therefore was later called the brother of God. Conscious of these past sins - lack of faith and unconditional love - Judas and did not dare to call himself the brother of God, but only called himself the brother of Jacob, as he writes in his epistle: "Judas, a servant of Jesus Christ, brother of Jacob" (Jude 1). In addition to the name of Judas James, the Apostle of Judah also has other names. The evangelist Matthew calls him Lefebv and Thaddeus. These names are given to the Apostle Jude not without reason, namely: the word "Leveve" means: "heart". In relation to the Apostle Jude, this name will mean that he is Judas, after he has been wickedly committed against Christ God, when he was assured that Jesus is the true Messiah - Christ the God, he connected with Him with all his heart. The apostle of Judah is also called Thaddeus, which means: "praising", for he glorified and confessed Christ to God and proclaimed the Gospel to many nations. we know very little about the life and work of the Holy Apostle of Judah. It is only known that at the end of Domitian's reign two grandchildren of Judas, who were engaged in the cultivation of the land with their own hands, were brought, by the slander of heretics, to this Emperor, as descendants of David and relatives of the Lord; but when the Emperor was convinced that no political danger they do not represent for him, they were released. The Apostle Judas, like others & quot; the Lord's brothers" in the flesh, has suffered many Evangelical works, spreading the gospel of Christ. Soon after the ascension of the Lord Jesus Christ to heaven, the Apostle Judas, like all Apostles of Christ, went to preach the gospel. According to the Church historian Nicephorus, & quot;the divine Judas, not Iscariot, but another, who had a double name of Thaddeus and Levi, the son of Joseph, the brother of Jacob, thrown from the roof of the temple of Jerusalem, preached the gospel and spread Christianity first in Judea, Galilee, Samaria, Idumea, then in Arabia, Syria and Mesopotamia, finally came to the city of Edessa, who belonged to king Abgar, where even before his preaching the gospel of another Thaddeus, one of the seventy Apostles. Here the Apostle Jude said and fixed what was not completed the Thaddeus". There is news that the Holy Apostle Judas preached Christianity in Persia, from where he wrote his conciliar message in Greek. The motivation or reason for writing this message was the fact that in the society of believers crept into the wicked people who turned the grace of God in cases of lawlessness and under the guise of Christian freedom allowed themselves all sorts of vile deeds. This brief message contains many deep thoughts and edifying teachings. It contains part of the dogmatic teachings: the mystery of the Holy Trinity, about the incarnation of Jesus Christ, about the difference between angels of good and evil and about the future judgment; part of the same moral teachings: admonition to avoid impurities of sinful flesh, blasphemy, pride, disobedience, envy, hatred, treachery and guile; the Apostle advises everyone to be constantly in the position, in faith, in prayer, in love, he wants us to care about the treatment of the erring, to save themselves from the heretics, even harmful for the morals which he depicted clearly and declared that the heretics of those will die like the people of Sodom (Jude.7). moreover, in his message, the Holy Apostle Jude says that it is not enough to be saved only to be converted from paganism to Christianity, but to do good deeds, decent to Christianity and worthy of salvation, and cites as an example of angels and people punished by God. God has bound the angels with eternal ties in the darkness and keeps them in his final judgment for the fact that they have not kept their dignity (Judas.6). People, hassled out of Egypt, God destroyed in the wilderness because they have fallen into debauchery, not living according to the law of God (Jude.5). Thus, the Apostle Jude reveals the great in his message of truth in short words. The Holy Apostle Jude visited many different countries preaching the gospel, turning the peoples to Christ's faith and guiding them on the way of salvation. In such works he reached the countries of Ararat and here, having turned many people away from idolatry, made them Christians. This the Apostle strongly armed against itself the priests of idols: they grabbed him and, after various tortures, hanged on the cross and pierced with arrows. Thus ended the feat and the life of his Holy Apostle Judas and went to Christ God, in order to receive from Him the crown of eternal retribution in heaven. cha kinsman of Christ, Judeo, leading, and Martyr rigid, sacred praise, the beauty of popravka, and faith, Zabluda: Wherefore this day all-Holy memory celebrating, the sins of the resolution by thy prayers acceptable. Paul aulisa companion of the Apostle, and SIM us the message heralded thou divine grace, linogliride Judeo blessed one, Wherefore we cry to thee: not pretty molyasya about all of us. strong mind, elected student you come thou, and the pillar of neiboring Church of Christ: the language, preach thou the word of Christ, granted verb in a single deity: from worthless to proslavilsya,, thou hast the gift of healing, celite ailments pritaikysime to you, the Apostle of the Judeo sexualne. The life of St. job, the first Patriarch of Moscow and All Russia. Saint job (in the world John), the first Patriarch of Moscow and all Russia, was born in the second quarter of the XVI century in the ancient Russian city of Staritsa in the family of pious citizens. As a child, John was taught to read and write by Archimandrite Herman, the rector of the assumption Staritsky monastery. The lad loved to read the Holy Scriptures and, having a great memory, he knew some texts of the Bible by heart. The monastic upbringing aroused in him a desire to serve God in a monastic image. Around 1553, when John graduated from the monastery, his father wanted to marry him. On the day of the wedding, the young man asked his parents to come to the monastery to talk to the spiritual elder. When he came to Archimandrite Herman, he begged the elder to mow his monastic vows. “John izvoli this world of vanity to go and vosprijatie Holy angelic image... And is destined to be a monk job & raquo;. Saint job Spent more than fifteen years at the Staritsa monastery, going from the novice of elder Herman to the Abbot. Under the guidance of an experienced Confessor, the young monk brought up in himself selfless and unforgiving, obedience and abstinence, learned heartfelt prayer and strict fasting. “...Was not a man like him nor the way, nor disposition, nor voice, nor rank, nor adventure, nor a question nor a response... The gift of God was to him more than other people. At the same time, Saint job was distinguished by deep humility, meekness and mercy. He never denounced or insulted anyone, he pardoned and forgiven everyone. As Abbot, St. Ives words and life have inspired the brethren to a spiritual work. In 1571 Saint job was appointed rector of the Simonov monastery in Moscow. With zeal he performed the obedience assigned to him. As the rector of one of the most important monasteries of that time, Saint job took part in the Affairs of The Russian Church, and often the state. In 1572, and later in other years, he was a member of the Church Councils. In 1575, Saint job was appointed rector of the Novospasskiy monastery and for six years headed the ancient Moscow monastery. On April 16, 1581, Archimandrite job was ordained Metropolitan of Moscow Dionysius and the Council of Russian bishops as Bishop of Kolomna. On January 9, 1586, the Saint was moved to the ancient Rostov pulpit with the elevation to the rank of Archbishop, and on December 11, 1587 the Council of bishops was appointed the high priest of The Russian Church, Metropolitan of Moscow and all Russia. On 26 January 1589, with the blessing and personal participation of Patriarch Jeremiah II of Constantinople, Metropolitan job was appointed Patriarch of the Moscow and all Russia at the assumption Cathedral of the Moscow Kremlin. The Russian government, the archpastors and all the people were happy to accept this significant event in the history of The Russian Church and state. The canonical subordination of our Church of Constantinople was abolished. In 1590 at the Council of Eastern hierarchs the canonical independence of The Russian Church was also approved. Patriarchs Jeremiah of Constantinople, Joachim of Antioch, Sophronios of Jerusalem, the metropolitans, archbishops and bishops present at the Council, identified the Russian Patriarch in fifth place in the diptych of the patriarchs — after Jerusalem. This decision was confirmed at the Council of 1593.
the main purpose of all the activity of Patriarch job was to strengthen the Orthodoxy and spiritual power of the Russian Church in Russia. Sainted job diligently improved the life of the Church. He spent a number of measures aimed at strengthening discipline among the clergy, the improvement of their morals and the maintenance of order in churches. Many works of the Saint were directed to the spiritual development of the people, the distribution of the Holy Scriptures and patristic books. Especially important was the printing of liturgical books started by the Saint, which were lacking everywhere, and especially in the newly-planted lands — in Kazan, Astrakhan, Siberia. By the blessing of Prelate of job was first published: Lenten Lean (1589), the festal Triodion (1591), the Octoechos (1594), the General Menaion (1600), Official Episcopal service (1600) and the Missal (1602). The Saint also took some measures to correct the existing inaccuracies in the liturgical books. Comparing ancient lists, he selected the best as a sample for printing. Patriarch job was the first to put the printing business on a broad basis. Under Saint job was some glorified Russian saints: St. Basil the Blessed, the monk Joseph of Volokolamsk (the Saint himself wrote him a Canon and “fixed”), the Kazan hierarchs Gurias and Barsanuphius, the Nobleborn Prince Roman of Uglich, St. Anthony, and Cornelius, blessed John of Moscow, St. Ignaty of Vologda and martyrius of zelenetsk. Some saints, already revered in Russia, were established new days of celebration. Saint job used his personal funds and rich Royal gifts for alms and for the construction of churches. Only in Moscow in the period of 1592 to 1600 the Saint built twelve churches. The blessing of St. job in Moscow was built Donskoy monastery, conception and Ivanovo monasteries, in the Vladimir diocese built Lukyanova deserts, in the Vyatka diocese — Bogoyavlenskaya Sloboda monastery. Monasteries were built in Siberia and in other dioceses: Kursk, Novgorod, Pskov, Kazan, Astrakhan, Tver, Vologda. Saint job was a zealous Minister of the Church and a wise pastor. These features were especially evident in his missionary work aimed at strengthening the Orthodox faith in remote areas of the state, as well as in Georgia. Under Saint job, the Pskov, Astrakhan and Karelian dioceses were re-established. Churches and monasteries were built in these dioceses and in Siberia. The Patriarch job was sent there by the missionary priests. Seeds of Orthodoxy, sown by Patriarch job, brought further their spiritual fruits, thanks to which the Northern and southern limits of the Russian state were preserved and strengthened. in difficult times of state turmoil at the beginning of the XVII century, Saint job preserved true Christian patience, fearlessness and courage. Seeking to curb the actions of the false Dmitry, he wrote a collegiate letter of the Kiev Prince Konstantin Otrogskogo, which urged him not to condone fraud, but to convey it to the Russians. Patriotic appeal he sent in Russian troops, the nobles and the magistrates. Among the common people's confusion, Saint job kept firmness of spirit and sought to bring organization in an unstable situation. After Godunov's death he was the first to Express his loyalty to the Dowager Queen Mary and her children. The boyars and all the inhabitants of Moscow swore an oath to him. However, not all supported the Saint. After some time, the false Dmitry seized Moscow. The high priest and the prayer book for all Russian people, Saint job fearlessly denounced the destroyers of the state order, who brought disorder to the Church of God. Most of the time he spent in prayer in the assumption Cathedral. One day during the divine Liturgy, the supporters of the false Dmitry brought the Saint out of the Cathedral with shame and led him to the frontal place, on the way they dishonored and beat him. After some time Saint job, exhausted in a simple black robe, was put on a cart and taken to a prison in the assumption Staritsky monastery, where he began his monastic feat. Saint job lived in the monastery for two years. Weakened and lost his sight, he spent all the time in prayer. after the overthrow of false Dmitry, Saint job could not return to the high Holy see because of his weakness. In his place, he blessed the Metropolitan of Kazan Hermogenes. St. job was distinguished by deep, pure faith, love for neighbors and the Fatherland, the assertion and protection of Orthodoxy, the sacrificial service of the Church of Christ, confirmed by his confession. Saint job died peacefully on 19 June 1607 and was buried at the Western doors of the assumption Cathedral of the Staritsky monastery. Subsequently, a chapel was built over the grave of the Saint. In 1652 when the Patriarch Joseph (1642-1652) incorrupt and fragrant relics of St. job was transferred to Moscow and placed near the tomb of Patriarch Joasaph (1634-1640). From the relics of St. job came healing. The veneration of the Patriarch job as saints is celebrated in different manuscripts and medieval books. His name is mentioned in the ancient Mesyatseslov among the saints of Moscow. Evidence of Patriarch job's Holiness can also be found in a number of hagiographic sources: in the «complete mesyatseslove Orthodox East», «Sources of Russian hagiography», «,« mesyatseslove Russian saints »,« book, verbalized description Of Russian saints & raquo;. In the second half of the XVIII century between the wall images of the Cathedral of the Savior monastery was the image of Patriarch job. At the end of the XIX century under Archbishop Dimitry of Tver (Sambikin; +1908) the day of the death of Patriarch job was remembered in all the city churches of the diocese of Tver. At the same time, with the blessing of Archbishop Dimitri, an icon of The Tver saints was painted, on which his Holiness Patriarch job was depicted. In 1907 the Russian Orthodox Church celebrated the 300th anniversary of the blessed death of the first Patriarch. Then in “Tver Eparchial sheets” it was hoped that the clergy of the Tver diocese to continue the work begun by the Patriarch Joseph in the glorification of his job. The completion of the canonical and liturgical decoration of the veneration of the memory of St. job has occurred in our days. The blessing of his Holiness Patriarch Pimen and the Holy Synod the name of St. job brought in the Cathedral of Tver saints. the first celebration of the Cathedral of Tver saints took place in July 1979. For the all-Russian veneration of St. Nicholas. Job was canonized at the bishops ' Council of the Russian Orthodox Church on 7—October 14, 1989.